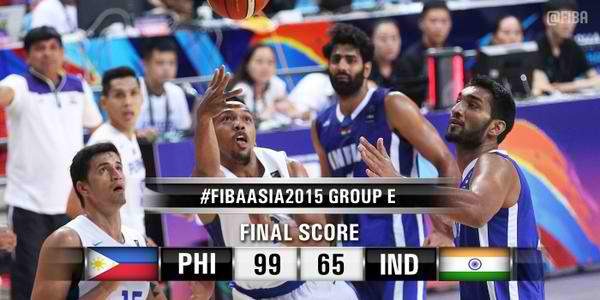 Video Highlights: Gilas Pilipinas beats India, 99-65 | #FIBAAsia2015 - Balita Boss! Watch the highlights of Philippines v India on day 6 at the 2015 FIBA Asia Championship (29. September 2015). The Philippines are heading to the quarterfinals as the top seed in group E after beating India, 99-65, to sweep the second round of 2015 FIBA Asia Championship. Six players finished in double figures led by Terrence Romeo with 20 points on 6-out-of-13 from the field, three rebounds, four assists and three steals. Andray Blatche and Ranidel De Ocampo added 15 and 13, respectively. Jayson Castro had 12 points for Gilas Pilipinas. Energy guy Marc Pingris and Calvin Abueva contributed well for Team Philippines. Pingris scored 12 points on 6-of-7 shooting to go with four rebounds and two steals, while Abueva was once again solid in his 19 minutes off the bench, also scoring 12 points to go with seven rebounds. Vishesh Briguvanshi scored 21, Amritpal Singh had 18 and Amjyot Singh added 11 for India, which still advanced as No. 4 seed from Group E.
The Philippine national men's basketball team will next face Team Lebanon, the fourth seed from Group F, in the quarterfinals on Thursday, October 1 at 9:30 pm.